Using the Trend Shift Pivot Zone plot (Green and Red Line), we consider Green to be Up Trending or Green Zone and Red to be Down Trending or Red Zone. These can be short or long term trends dependent on Algo Plot of the chart and ATR match of the symbol. 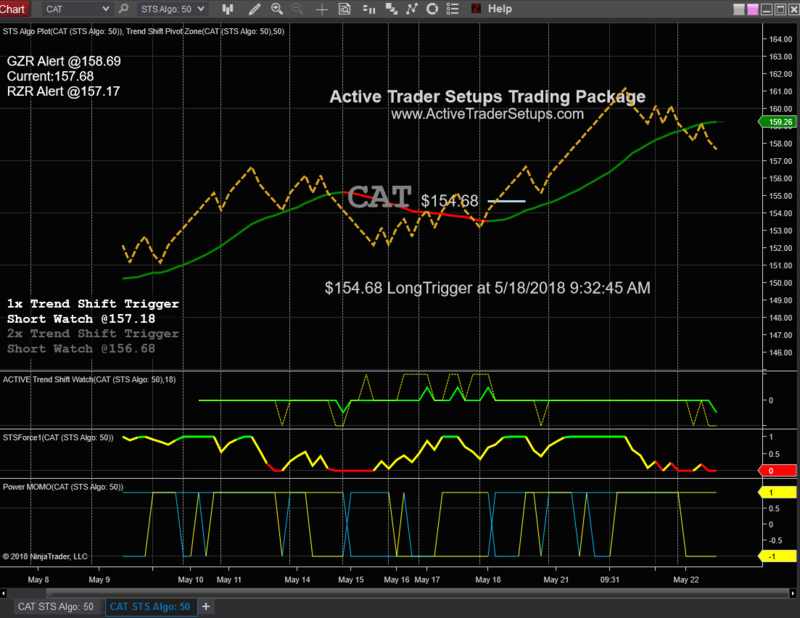 The below charts on CAT are a 50 Algo and represent a medium trend plot great for multi day Swing Trade or Option Trade Setups. Please note the Features displayed in the 2 CAT charts. The left chart shows a plot where the Red Line switch to a Green Line as the Trend Shifted and the Plot of 154.68 shown on chart appeared to the penny when the plot color switched from Red to Green. Also that Long Watch Trigger price had be shown in the lower left area Prior to the Trigger. The plot of 154.68 will remain on the chart until the next Trend Shift occurs (Green line changes to a Red line) as shown on Right Chart. When the new Trend Shift on right chart is plotted the previous plots are removed. Also Note: The Text Line "154.68 Long Trigger at 5/18/2018 9:32:45 AM", this text line give traders the Exact Date and Time the the Trigger occurred. (to have this shown or not shown is optional). This is a awesome tool for chart review and study. The Short Watch Trend Shift Setup is first indicated by the cross of the Green Line Plot. We teach and expect a revisit (which is a minimum of 2 factors - so in this case +1.00 retracement then failing as expected at the Green Line. In the lower left corner the Trend Shift Trigger display box appears any time the setup is with in 2 factors of a Trend Shift Watch Trigger. The price is indicated in the box. You will either see 1x (as shown in the diagram - the 2x is null if 1x is present) or you will see a 2x ONLY with a Trigger Watch Price shown. The 1x indicates we are within a 1 factor (in this case a 50 factor or .50 cents) a 2x would indicate 2 factors away. Left Chart Shows display box 157.18 Short Watch Level - then on the Right Chart the display box is no longer visible. The Right Chart now shows the Plot of 157.18 which appeared as shown in the text area of that trigger "157.18 Short Tigger at 5/22/2018 3:04:20 PM" precisely when the Price Triggered. 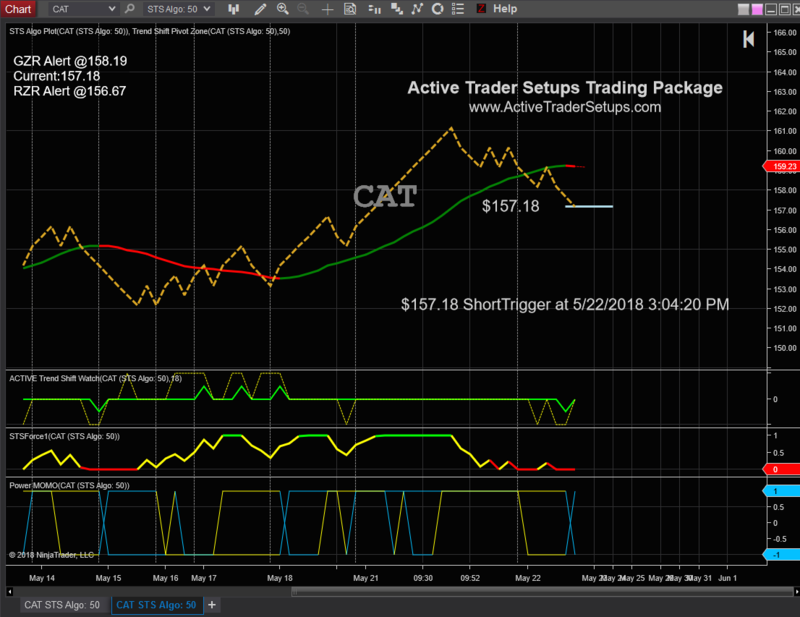 (the display box for the short what has been fulfilled) Also Note the lower indicator on the Left Chart had 2 Yellow 1 and after the Trigger the Right Chart the lower indicator now has 2 Blue 1 - This is our Power Momentum Indicator. 2 Blue 1 indicate current momentum. When this occurs at the time of the Price Trigger we expect Momentum in the direction of the Trend Shift Indicator. The charts shown below were occurring during the last day and a half of the above chart. The Right Chart is the next lower 25 Algo Chart and the Left Chart overlay the 25 Algo Trend Plot (Red Line) over other indicators for Yesterday and Today Inflection Points that include Highs and Lows, the Open Price, Yesterday Closing Price and VWAP. 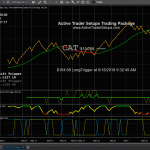 Using the Trading System Charts to guide expectations and aligning with know Inflection Points create a good combination to formulate a Trading Plan. Notice as the Price Plots (3 peaks golden dotted line) on the Right Chart rises into the Down Trending (Red Line) Plot each time it reverses on an inflection point. So instead of planning a Long Trade each time the price rises our trader's expect a Short Trade as our setups teach. The Inflection Points on the Left Hand chart. From the right the 3rd peak back, that is early morning just after 10 am price rises into the faded blue dotted line (Yesterday Open Price). The 2nd and 1st Peaks from the right both approach the falling Red Line (expected reversal point) and both times the price reverse at the orange dotted line VWAP. Instead of think I am going long at VWAP you can expect the Short at or near the VWAP respecting the prevailing Down Trending. Also on the middle price rise the Pink dotted line just above the vwap is Yesterday Low of Day plot. Yesterday support after breached becomes Today's Resistance. 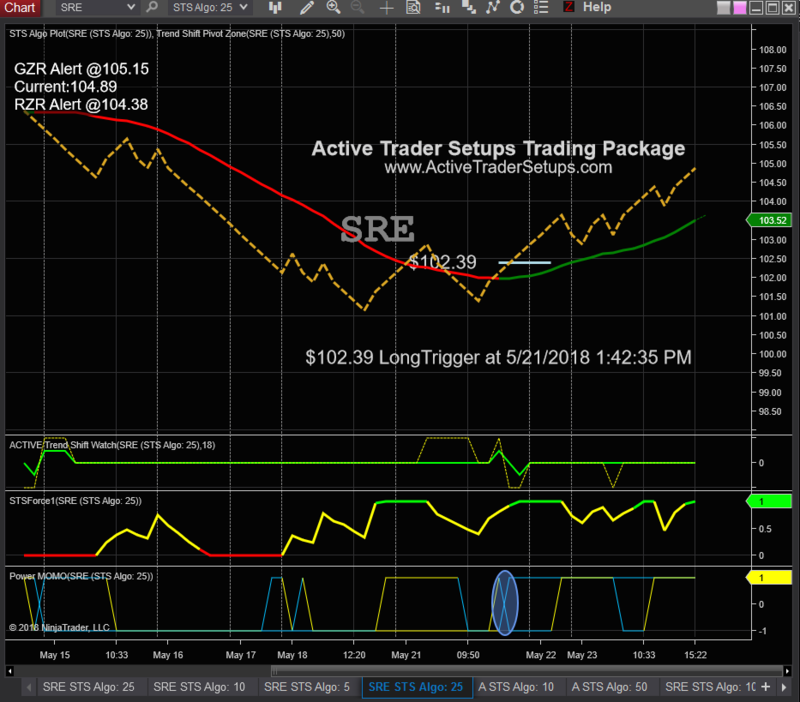 SRE is a lower ATR stock and the 25 Algo would be a multi day setup. For a Day Trade you would use a lower Algo such as 10 Algo chart. Using a Long Trigger on a 10 Algo and the STSForce Indicator Green color indicating Strength this stock gave a move of about 1.50. But for a Swing Trade Setup we teach the cross above the Red Falling Line or even a cross above the Red Falling Line of more that 3 Factors and then the line indicates a Trend Shift (change to Green color line) you should expect a Pull Back to the line. Preference is to pull back to the line and if the Line has changed Color - not to plot below the line. As mentioned above SRE is a lower ATR stock and the 25 Algo would be a multi day setup. So in this case as the above right chart 25 Algo setup for the Long Trigger Watch the above Left 50 Algo chart was showing STS Force Strength at 1 = Green. Also Note in the Circle at lower indicator the Power Momo Indicator switch the 2 Yellow 1 to 2 Blue 1 at the precise time the 102.39 Price crossed. You have a No Emotion Trading Plan, Precise Trigger Prices on the Chart Pre Trade, Other indicators to separate the Higher Probability Trade Setups from the mediocre. BDX shown below is on a 25 Algo Chart which is Day Trading factor for this symbol. 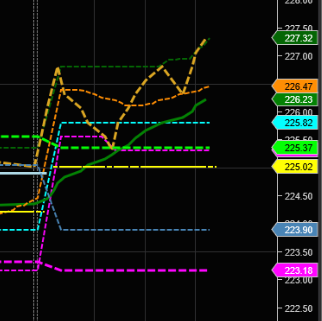 First the Trend Shift Long Trigger at 225.23 was very late day, second even if it were earlier in the trading session we will not be interested in this trade setup (the chart back to our left show a FLAT red line and multi red to green, green to red, and red to green plot change) . This stock in range bound (in a chop). This could be placed on a Long Watch for the next trading session. 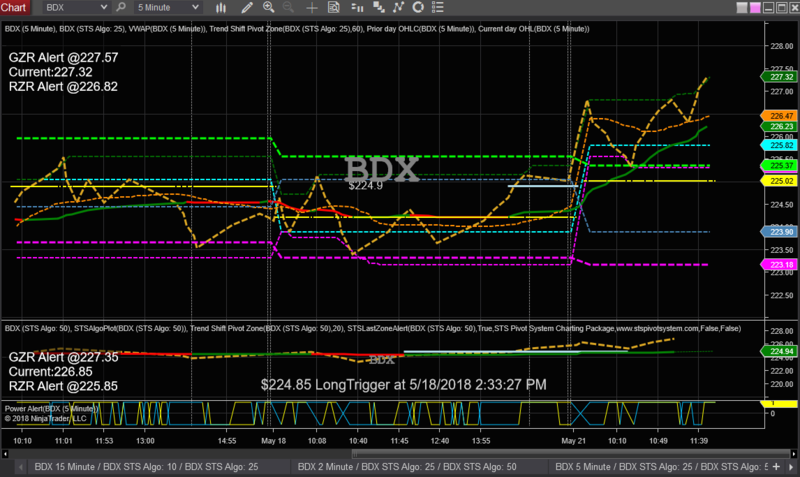 The next session BDX gapped up and ran up about 1.50 in the first 10 minutes (this cannot be safely trade or predicted at that point). In our chart education we know that on a break out of trend shift the expected move is 6 to 10 factors. This is a 25 factor chart and we have a move of over 2.50 so a pull back or retracement is exactly what we can expect. Our chart education also teaches to expect a pull back of 3 to 5 factors. Over the next 40 minutes of the trading session BDX pull back exactly $ 1.50 from the morning high to the reversal point. So we have our Retracement Setup in place and you see on the chart visually that we are approaching the now rising Green Line. Now please see the lower indicators, the top indicator is the ACTIVE Trend Shift Watch. What it indicates is when the Green Line is up there is a display box in the lower left corner showing a Long Watch Trigger price and when the Green Line is down the display box shows a Short Watch Trigger price. 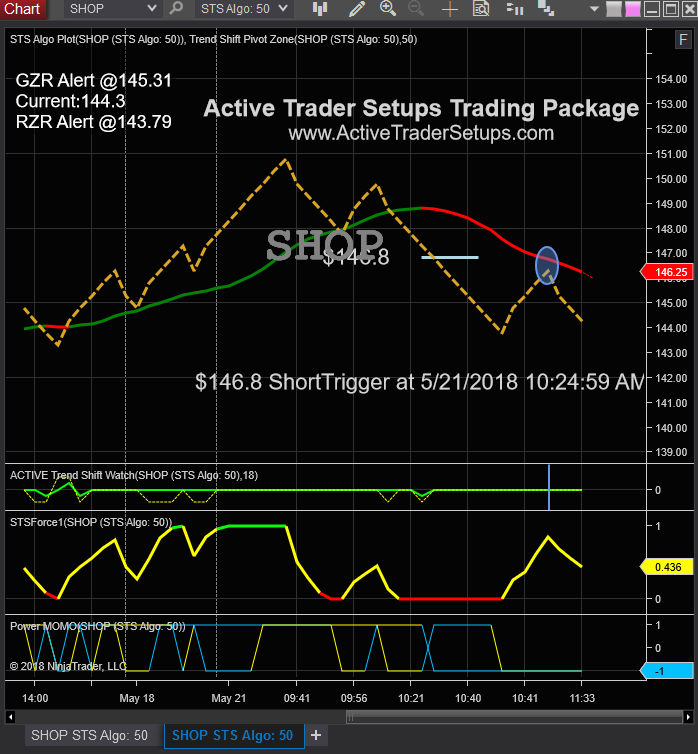 GZR Alert is the Trigger Price for the Retracement Setup to confirm reentry into the prevailing Trend. This display box is always present in the upper left corner of the Algo Charts. Current: Price is the actual last algo plot value. 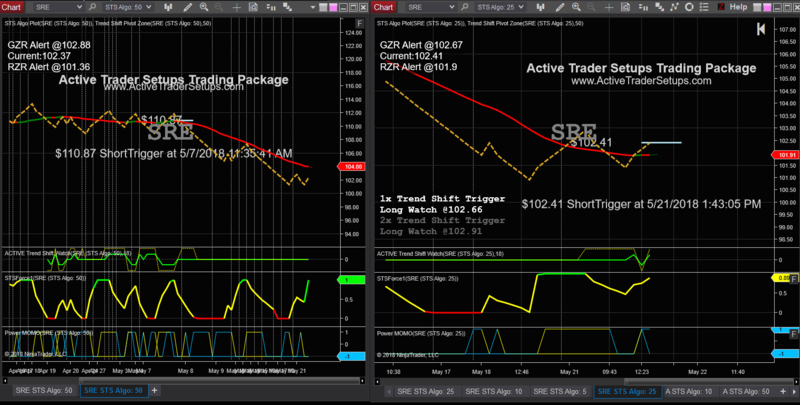 GZR = Green Zone Retracement Alert is used when you have a Retracement back near a Up Trending Green Line. 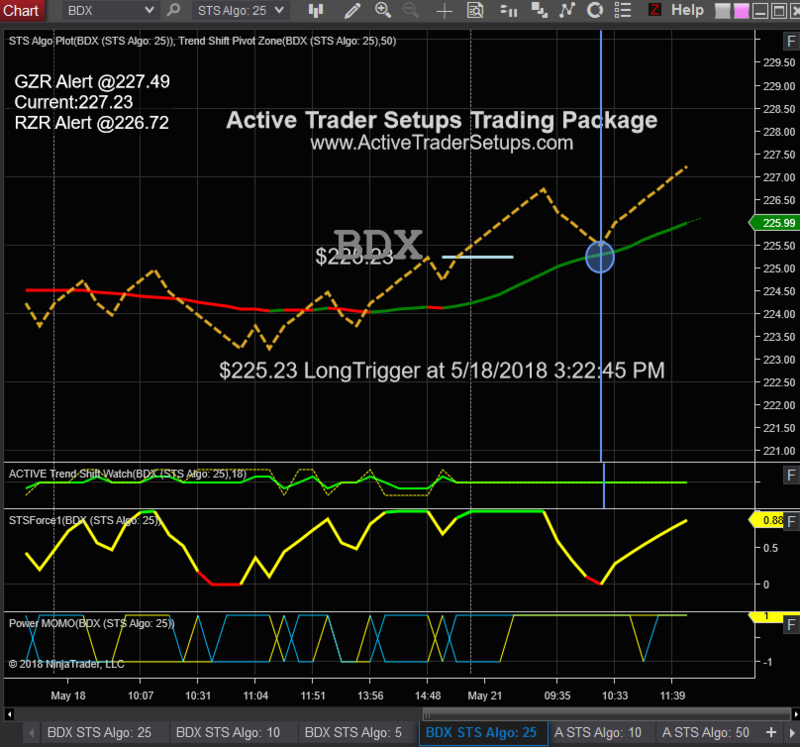 RZR = Red Zone Retracement Alert is used when you have a Retracement back near a Down Trending Red Line. Chart Below is a short term Support and Resistance chart with key inflection points plotted. Every Trader should have a quick reference to. Please NOTE on our Retracement Setup on the 25 Algo BDX chart the low of the pull back was 225.32 at 10:30 am (you can find this on any 10M chart on May 21st, 2018). That pull back was .05 cents below the Lime Green plot 225.37 Yesterday's High of Day. Old Resistance once crossed becomes New Support. This is a trade setup that could be entered on a day trade early with a extremely tight stop because we are at a Key Inflection Point. Even a new Trader has heard Old Support New Resistance - which is the same as Old Resistance New Support. Our Trading Package does not reinvent anything. 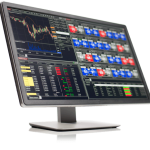 Our system simply arms the trader with the information needed to make informed decisions. 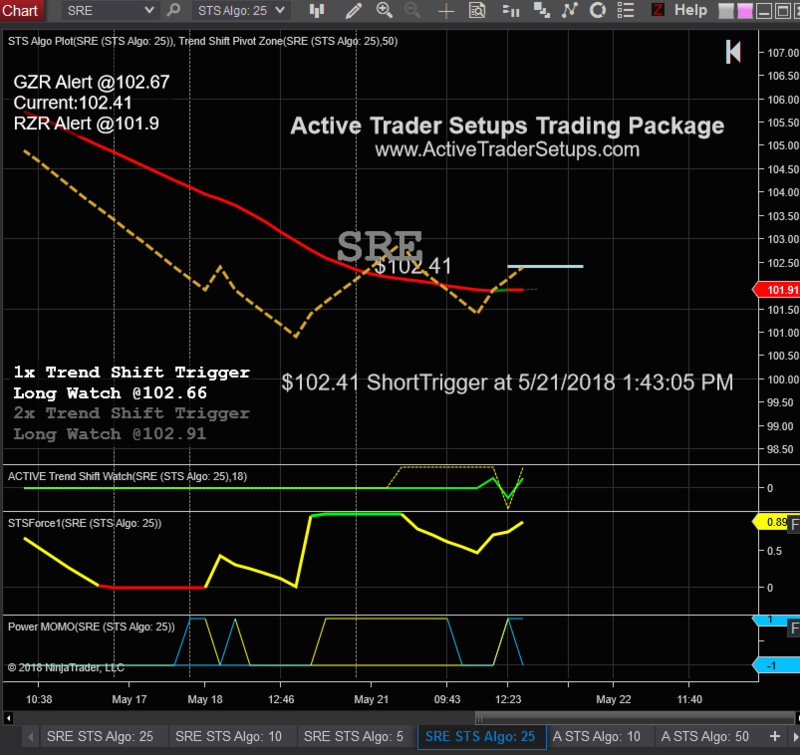 Our Proprietary Charts, with 4 Setups approach trading from a No Emotion Trade stand point. Our education is to keep our clients from considering a trade until the best indicated time and setup. Below SHOP chart is a 50 Algo on a high ATR stock that moves rapidly. The 146.80 Short Trigger at 10:24 AM by 10:40 had moved down over $ 2.00. It also had the STS Force Weakness indicated by the Red Line going into the Short Trigger and the Dual Blue 1 Cross on the Power Momo lower indicator. The Retracement Setup was as taught in our education of expected retracement amounts. The bounce from the low to the top of the retracment was $ 3.06, that is a 6 factor retracement (50 factor chart time 6 factors). First the Chart Down Trend is well defined by the slope of the Red Line. On this Retracement Setup (see the blue vertical line) the Trend Shift Watch is not showing a Long Watch Trigger display box was present on this rise in price which increases the probability of the reversal to the prevailing down trend.